My phone buzzed in distress the evening of Nov. 10. UC Santa Cruz had just sent a text alert warning me and other students that someone had seen a mountain lion on campus. Stay indoors, it said. Luckily, I’d managed to pry myself from work at a computer lab an hour earlier, and like a normal person, go home for dinner that night. Like a small woodland creature, I thought, I’m so glad to be in my burrow right now. But the text didn’t faze Justine Smith. Smith is an upbeat, enthusiastic doctoral student studying mountain lions, also called pumas (or cougars, catamounts, or panthers). She studies how people affect Puma concolor‘s behavior, causing changes that can ripple through the ecosystem. In the Santa Cruz Mountains, Smith said, pumas have only attacked one person “at least in the last century”: a 6-year-old with nonlethal injuries. “Pumas are afraid of people,” she said. We’re lucky. Weighing up to 180 pounds with a sprint speed of 50 mph, pumas kill with stunning speed and power. A puma can pounce on a deer from behind, locking its teeth into the deer’s throat at the base of the skull to break its neck or close the windpipe. Here’s a clip of a killing with an incongruous, but completely relatable, voiceover. The predator-prey struggle looks uncannily like a wrestling match. Numbering between 4,000 and 6,000 in California, pumas aren’t endangered. But in areas with high densities of people, pumas get scared and frequently abandon their kills; so they must kill more often to make up the deficit, according to a paper Smith recently lead-authored. Smith and her team are now wondering, how is the effect of those extra carcasses cascading through the ecological community? Scavengers, like opossums, gray foxes, bobcats, vultures, and coyotes, may be benefitting, Smith thinks. 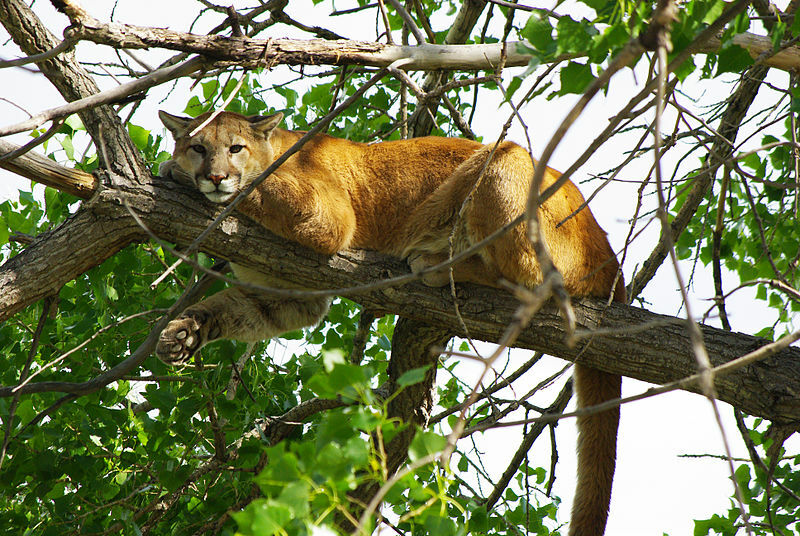 A puma will often feed on a carcass over several days, caching a prey animal under duff like leaves or pine needles to slow its decay or deter scavengers in the puma’s absence. But scavengers scrounge the meat anyway, and make the most of a meal that’s lying there for the taking. To uncover how humans are indirectly affecting this ecosystem, Smith and her team are monitoring pumas that live within different proximities to people. By tracking when pumas get scared off their kills and how often scavengers descend, the team hopes to find how energy is flowing in the food web – and potentially away from pumas – because of people. Humans already do a good job of encouraging scavenger populations with our delectable fruit and garbage, according to Smith’s advisor, UC Santa Cruz wildlife ecologist Chris Wilmers. And reaping calories from puma kills could give them a boost, Smith said. To observe puma and scavenger activity, Smith has to find fresh kills. When pumas successfully take down prey, they tend to stay with it for a few hours, she said. Radio collars, which Smith’s lab uses to track over a dozen pumas, relay that signal via cell-phone towers to Smith’s inbox. They let her know: it’s showtime. Literally. When she gets that email, she drives to the site to set up a motion-activated video camera to record whoever comes to dine. She also ties down the carcass to a nearby tree or ground anchor to prevent it from being pulled off-screen. The hours of footage she gets back often fail to scintillate. “Opossums just feeding forever. Not super fun to watch,” she said. But then moments of intimacy can appear onscreen. At her office, she pulls up a Youtube video she’s posted of a mother puma giving her kitten a tongue bath, while the kitten bats at mom with playful paws. Watching them mesmerizes me. The kitten acts like a cat I might scoop up in the driveway during an afternoon when we both crave affection. But an adult puma, as we’ve established, can take down a kicking deer. Cognizant of the fact that I’m comparable in size, I bear pumas more respect than I would a pet. A deer carcass left by a puma outside a home in Felton, CA. Photo courtesy of Justine Smith. But do these changes in behavior impact how often they reproduce, Smith asks? Until researchers address that question, they won’t know if living alongside humans threatens puma survival, Smith said. To find out, she’s hoping one of the new graduate students in her lab will take on the project of monitoring puma families. Measuring society’s effects helps us protect pumas by guiding conservation efforts, said Wilmers, who’s been working on pumas since 2008. An example of vital information? Female pumas with cubs need a much larger buffer from humans than do males or single females. To ensure the species can survive, we need to make these remote areas accessible to pumas, he said. After a puma was killed on Highway 17, Wilmers has been working with the Land Trust of Santa Cruz County and Caltrans to build a tunnel for wildlife. The corridor would allow them to safely cross between northern forest in Scotts Valley and the summit of Highway 17. He expects the project to be finished within five years. Alison F. Takemura is a science communication graduate student at UC Santa Cruz. You can follow her on Twitter @AlisonTakemura or send her an e-mail at atakemur@ucsc.edu.